This case study details how Nitor worked with a public sector client to source, select and advise on the implementation of a technology solution designed to streamline the procurement process and drive efficiencies. 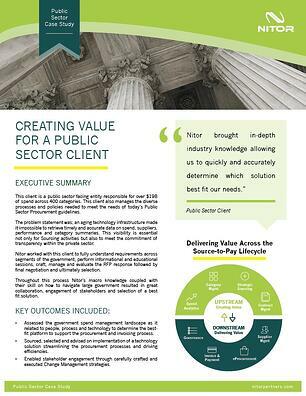 This public sector procurement case study details the challenges the government entity client faced and how Nitor services designed and implemented the solution. As well as the methodologies used to assess and implement change related to people, process and technology in the source-to-pay life cycle.